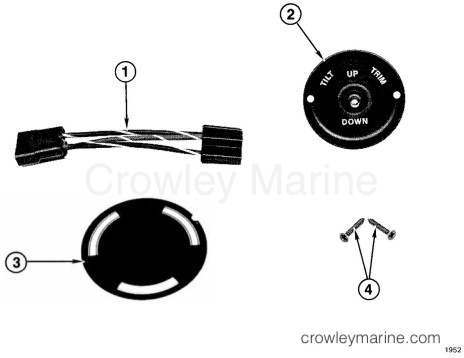 This kit permits installing an in-dash trim/tilt switch to activate the trim/tilt system on all OMC® Stern Drive, OMC Sea Drive®, Evinrude®, and Johnson® trim/tilt models when remote control handle mounted trim/tilt switch is not used. Dual engine installation requires two kits. 1. Check contents of kit. Back side of mounting area must be free of electrical wires. Back side of mounting area must be free of steering cables and hoses. Trim/tilt cable must be long enough to ensure good connections. 3. Drill a 35 mm (1 3/8 in.) diameter hole for the trim/tilt switch. 4. Use the trim/tilt switch and bezel as a template. Position bezel so mounting holes are horizontal. Make sure words on bezel are properly positioned. Use center punch or awl to mark both mounting screw holes. Drill two 3 mm (1/8 in.) diameter holes. 5. Route trim/tilt cable (C) from back side of the 35 mm (1 3/8 in.) diameter hole and connect male connector (B) of jumper wire assembly. 6. Install female plug (A) of jumper wire onto back of trim/tilt switch. 7. Install trim/tilt switch assembly into the 35 mm (1 3/8 in.) hole and secure plate with two mounting screws. 8. Secure trim/tilt cable and jumper wire to back of dash to avoid strain on connectors. 9. Install applique to remote control handle if desired. 10. 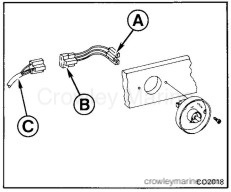 Test the trim/tilt switch for correct operation. When switch is in "up" position, unit should raise.